Isn’t it crazy how far we’ve come? To most outsiders, this community might not mean much to them. They don’t know about the Saturday practices and Sunday games, the feeling of spending an entire weekend with your team during the Tigers tournament or meeting up with your friends for Obon on those hot days in July. The feeling of being around people you’ve known all your life, growing up and playing against all your OCO teammates in high school and college. The feeling of excitement and connection when you see a complete stranger representing a Nikkei or Yonsei T-shirt around town. Being in the CSULB Pyramid in August surrounded by all of your family and friends, or driving to Las Vegas for the most anticipated JA basketball weekend of the year. To outsiders, none of this makes any sense. But this isn’t for the outsiders. This is for the invested people in the JA basketball community. The community I grew up in and have come to love. The only community I’ve ever known. This is for you, JA basketball, this is for us. To think it was just a mere 85 years ago that you became a public circle, a common ground and safe space for all Japanese Americans facing discrimination during and post World War II. When we were forbidden from becoming naturalized citizens after the war and were kicked out of all the regular sports leagues, we looked to you. What started as a way to stay connected and stay out of the rampant prejudice of the post-war would flourish into a colossal region. In a spread-out community of over 50 different organizations with an estimated number of 18,000 participants all over Southern and Northern California alone, you united us all. You have always been more than a family custom or expectation, but a induction to the Japanese American community as a whole. People looked to you as a vibrant remembrance of our culture and significance, and for that, we thank you. You have always been one of those things that everyone did. Everybody plays, and if you don’t or don’t at least try, it’s almost like a disrespect to your family and the JA community. I remember being 6 years old, enrolled in the Chibiko youth clinic and disliking it. I disappointed my parents and quit basketball. I was completely removed from the community for three years until I made the conscious decision to rejoin the league on a very nice OCBC team and never left. After nine years in the community I’ve gained way more than I could of ever expected. I’ve come up with a closer family bond, friendships that will last a lifetime, organizational scholarships and awards, an intimate tie to my Japanese culture and without having to join a club basketball team, all the experience I needed to commit to play collegiate basketball. The number of JA players that play basketball at the varsity and collegiate levels is impressive. We are proud products of your establishment. We may live with the stigma and stereotypes of being “small, short and un-athletic” but we emerge with sound fundamentals and substantial knowledge of the game that we’ve picked up in the JA league. Growing up, I looked up to one of the most profound JA players of my generation, Jamie Hagiya. Standing 5’3”, she was the starting point guard at USC and finished her career fourth in assists and second in three-pointers. She’s become a celebrity in this community and a positive role model for all young JA players. I strive to be like her and to create a positive name for myself within the community. On one of the current freshmen OCBC teams, all nine girls made their high school varsity teams. On the current Chapman women’s basketball team, nine of the 15 roster players are all well-established JA players. Not to mention head coach Carol Jue, who’s a prominent face in the Asian American basketball community. Approximately five players on every JA team will go on to play varsity basketball in high school and one player of every two JA teams will go on to play collegiate basketball. Through one connection, there are so many doors. We have all sprouted from your roots, and have come a long way to prove that our community isn’t something to be overlooked. But you are more than just a producer of superstar basketball players. You introduced me to all my closest friends. Through you, I have created lifelong friendships and relationships that can never perish. In my opinion, that’s the most important part. You were created to keep the community connected and united. You have done that and so much more. You have been the glue of our generation and something that bands us all together. It’s amazing to meet people who understand and relate to me culturally and also through basketball. Not only have I made incredible friends, but have a powerful bond with my family due to you. Spending long weekends together, talking about how we can improve our game, and despite our four-year age difference, I had the pleasurable opportunity to play alongside my younger sister, Britney, in my final year of SEYO basketball and now, once again in the OCSA leagues. It’s these precious moments and unforgettable times that we’ll hold dearest to us until the end of time. It’s not about winning or losing, but about creating these everlasting relationships that we’ll keep in our hearts forever. We may not remember who scored the most points, what team we played or what the final score was, but we will remember how we felt during these times. We will remember all the fun we had and remember being submerged by our family and friends. That is the most important part of your existence. It’s more than just basketball. You’ve given us a family within this community, and we’re all eternally grateful. So here’s to you, JA basketball. For all the friendships I’ve made, all the opportunities and advantages granted to me, the culture I’ve been submerged in, the close family bond I’ve grown, the incredible basketball experience I’ve endured, and the feeling of belonging, I owe it all to you. Without you, I’m lost. I wouldn’t have the opportunities and exposure to flourish in all the basketball I partake in. I wouldn’t have the cultural presence that others lack. I wouldn’t be surrounded by all of my closest friends and I wouldn’t be as close to my family as I am right now. Camryn Hamaguchi was a two-sport star (basketball and track) at Kennedy High in La Palma. She was the team captain three years in basketball, as well as All-League MVP and the team leader in scoring and free throw percentage in her junior season. 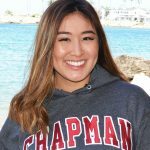 Hamaguchi recently completed her first year at Chapman University, where she majors in business administration and plays at guard on the women’s basketball team.